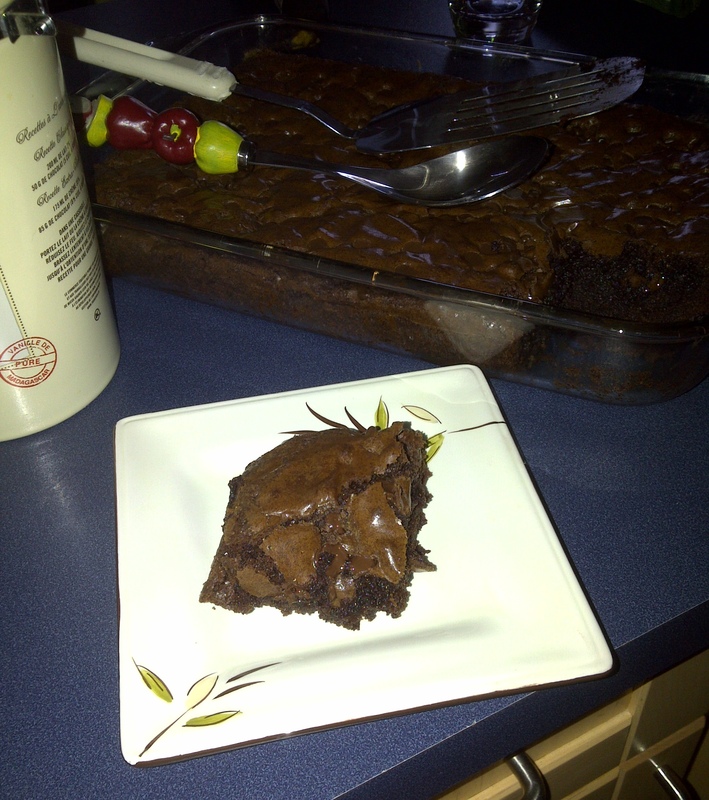 The Valium Chronicles: The Brownie Incident - Be Nice or Leave, Thanks! Situation: BFF orders me to bring Brownies to her house for Sunday dinner. She also orders me to make a double recipe and pick up ice cream. Order is made at approximately 5 pm. Dinner is for approximately 6:30. 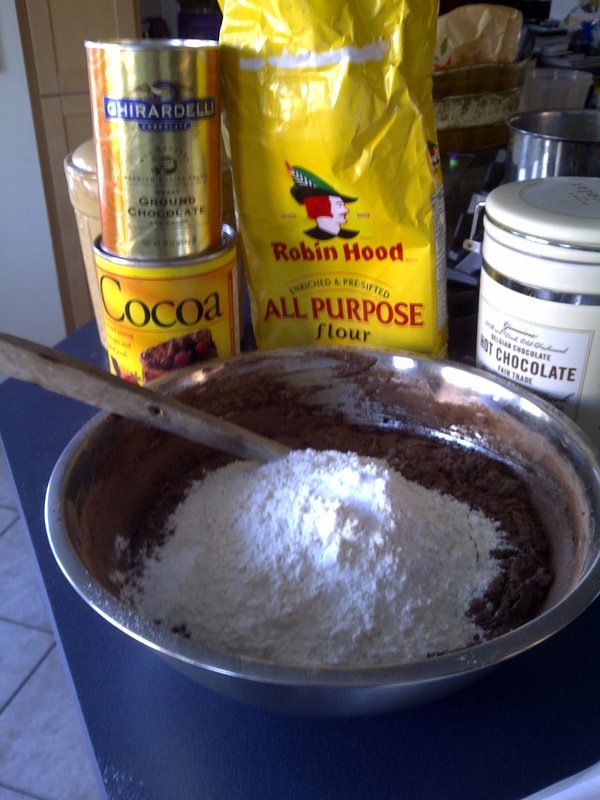 I have a short window of time to prepare a coco-rific masterpiece. Thus a frenzy of egg-dropping-on floor, flying flour and screaming ensues. Usually, I use my ratty old metal pans with trusty parchment which means I don’t have to clean up the pan (look who’s smart lazy now) . Since the tools are different and I’m very distracted by everything (as usual), as I start to dump the Brownie mixture into the Pyrex, I realize…. Now, what I could have done was stop pouring, put the mixture back in the bowl, wash the pan, grease the pan, and pour the mixture back in the pan. That’s what I could have done. Instead, I finish dumping, smooth it on top, bang out the bubbles, sprinkle some chocolate chips on top (everything’s better with extra chocolate), throw it in the oven, and cross my fingers (and of course, tweet my impending disaster to garner widespread sympathy). I check on the Brownies partway through. They look like they are pulling away from the sides. That seems to be a good sign. They come out of the oven. They look gorgeous. Diva convinces me to put them in the freezer to cool so the pan will be easier for me to carry to Bff’s around the corner so she can have a piece. After 5 minutes, I take the pan out of the freezer, gather my implements (steak knife, salad server), cross my fingers, and YES! 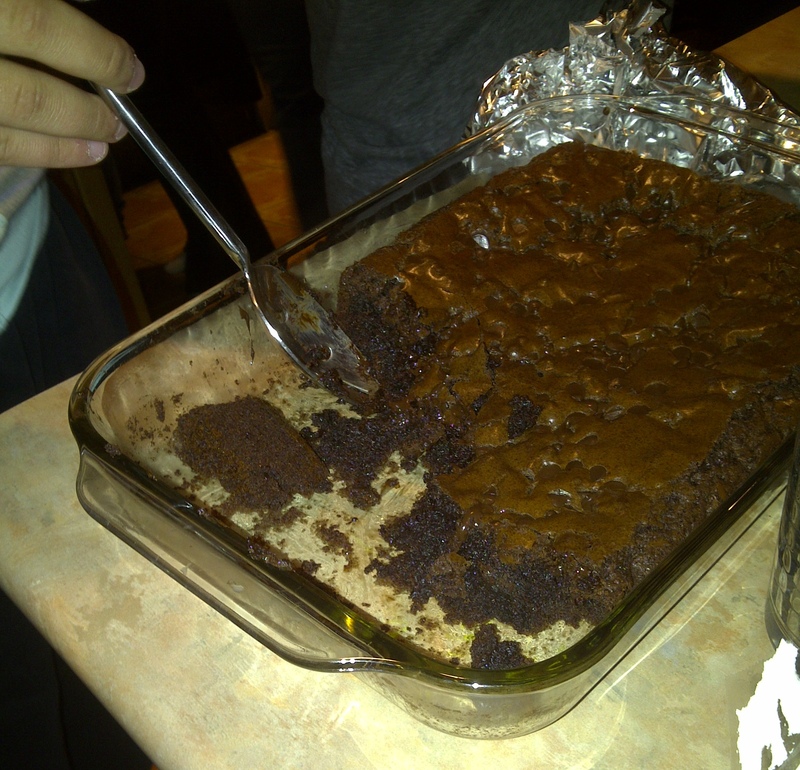 The brownies are only SLIGHTLY STUCK TO THE PAN. Look at that piece of Brownie! Lesson learned: You don’t REALLY have to grease the pan when you’re braking brownies with 2 cups of butter in a pyrex dish. Who Knew? Here’s the recipe, adapted from Marcy Goldman’s amazing book, ‘A Treasury of Jewish H0liday Baking‘ . You can also find her at www.betterbaking.com. Melt two (2) yes! two yes (2) cups of butter. Let cool, and then mix up in a BIG bowl with two (2) yes! two (2) cups each of white sugar and brown sugar. Wooden spoons are great for this, as are silicone spatulas. Next in are 6 (six) eggs. Don’t forget to throw drop a couple on the floor to make your husband work a bit. Mix-er up, adding and mixing 4 tsp vanilla extract, 2 cups unbleached white flour (FINE you can use all purpose whole wheat if you feel the need, but HELLO, the BUTTER), 1/2 tsp salt, and 1/4 tsp baking powder. Pour into the pan, shaking and evening it out with the spatula. Don’t stick your face in the brownie mix, rather wait until its cooked. Bang a few times on the counter to get the bubbles out. You can top with any of the following: Dark, milk, or white chocolate chips, skor bits or nuts. You could also, as Diva said, break up graham crackers and mix with mini marshmallows, and put that on about 5 minutes before its done cooking. Oh yeah, it takes anywhere from 25-40 minutes to cook. It will crackle on the top, and the centre should not be jiggly. But don’t overcook. Keep your eyes on it, checking every 5 minutes after 25.